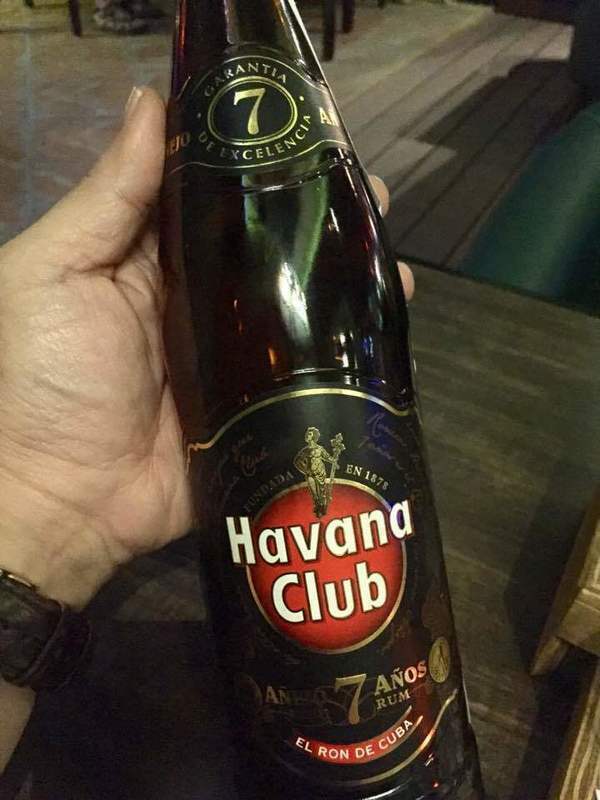 Have you found an online vendor selling Havana Club 7-Year? Havana Club 7-Year Rum is distilled from fermented molasses and aged in charred white oak barrels for seven years. Havana Club rum is still made in Cuba - where the company was founded by José Arechabala in 1878 and then nationalized in 1959 after the Cuban Revolution. Havana Club is now jointly owned by Pernod Ricard and the Cuban government. Shorter finish with only a hint of spice. Some rubber and barky hints. Not overly complex. Not a bad rum if you can get around the big leathery tobacco-like note at the beginning. I personally don't like it, but if you sip your rum while smoking cigars, you'll love it. I do think this rum actually suffers from some overrating (and price inflation) as its political/historical context make it the Che Guevara t-shirt of the rum drinking world. If you sip it on its own merits, its not bad but not great either. HC 7 is not superb and not really bad. It is for me the most drunk rum, known by almost everyone. It's not sweet, has typical cuban notes wood, leather, a bit smokey. It tastes strong although it's not only the alcohol in it, its the flavour itself. As it is easy to buy worldwide (except USA I think) and not too expensive (last bottle I bought cost me 17 Euro) it is absolutely ok for the price. But if you like HC7 I suggest to try other cuban rums that lead a bit into similar directions and are far better for the same or lower price as Caney Centuria or Legendario Añejo (not the sweet Elixir one, that's something different). I consider it a rum to mix with coke or for coctails, I'd not be able to drink this one straight. This is a favoured rum, I enjoy it a lot, one of my regular ones. I have it with a little water, sometimes with ice. There is nothing negative to say about it. Unmistakably Cuban from the moment you open the bottle, it has a aroma that is full of fruit and a suggestion of being older than it is. Perfect to drink by itself, with ice or even with your favourite mixer. A rum you can give to anyone, for their first taste or a rum connoisseur. This rum makes an "I'm Cuban" statement clearly crafted to be enjoyed alongside a cigar with its complementary tobacco undertones. It's lovely on the nose giving lots of sweet molasses and noticeable vanilla. The palate arrives sweet and spicy developing hot sweet chilli pepper, tobacco wood and light vanilla. It finishes with light syrupy spiced tobacco and a shows a mild short lived helping of base rum sourness that hasn't been completely aged out in the 7 years in oak. This doesn't mar the aftertaste and it goes down well glass after glass. If you like Bourbon this will suit you. It may not suit everyone though. You can grab a bottle for about 20 quid and it definitely holds its own against bottles twice that price. Bit too much E150 but they stick that in every rum - you just cant avoid it. Added sugar is only 5gpl. A very pleasant surprise this Easter and given it's price I'm almost going 8/10. Cheers! For what it costs it's an amazing rhum. Not too sweet and rather complex for it's age. I like it more and more after every sip i take. Ok, first I will apologize for the use of that much-scorned descriptor: "Smooth". However, I was duly impressed at how effortlessly this just slid in as I drank it. Now, that shouldn't be surprising since it is only 80 proof, nevertheless, this really stood out, and likely because lower proof spirits often come across as watery and thin. Not this rum! I'm not yet adept at going into particulars in terms of specific tasting notes, but I will say that this is quite a delicious, light rum, though it's flavour is somewhat understated. It didn't knock my socks off with bold flavours, but it was something that I could just keep sipping and sipping - truly dangerous. Just for added info: I'm primarily a whisk(e)y drinker, though I have begun to branch out to tequila, rum, cachaca, and gin. The rums I have tried and enjoyed so far are Mount Gay XO and Rhum Vieux Labbé 3 stars, as well as Soul Cachaca. This rum is simply wonderful. It is not completely smooth, but leaves a lingering taste of oak and molasses that makes drinking it memorable. There are better rums, like Tributo 2016, but I have found no better rum in this price range. If you are in Cuba, don't settle for anything less. Not greate as sipper! but ok for Coke drink and other drinks. Der Preis schwankt immer zwischen 20€ und 28€. Man kann ihn pur trinken, aber meiner Meinung nach ist er besser für einen "sehr guten" Cuba Libre geeignet. Very available rum. Can be bought at any store. Slightly spicy and smoky flavor. For me better than Flor de cana 7yo. Sampled this rum while in Cuba, aromas of caramel and molasses are evident to the nose. This is a decent quality rum that I would qualify as a good sipper rum. Oak is noticeable and the finish is smooth. This is the classic rum anyone should start with, affordable balanced, surprisingly. The first time you open the bottle and drink it, you find it strong with abondant alcohol taste (as is the case with most rums) but let the bottle sit for a week and try again. Nose: very clear smell of honey and chocolate. And in the background you get tobacco and vanilla. Exactly what's written on the outside of the bottle, no kidding. Palette: Full body. This is NOT a mellow rum. Not detecting much taste. There is a slight harshness. Unlike what many people say, this is a great sipping rum, if you're looking for clear rich flavors. This is an excellent rum to pair with heavy cigars. Don't drink it with mild cigars though as this rum will overpower the cigar's taste. This was a gift from my brother John from overseas. Thanks bro! Sehr guter Mix-Rum, durchaus auch pur zu trinken (in der Not). In der Nase und Gaumen ein wenig streng, Karamell, Toffee. Very good mix rum, quite pure to drink (in the emergency). In the nose and palate a little strict, caramel, toffee. A reference in roundness. Very well balanced, easy to drink. Lacks some power and spicyness maybe. A classic for my mojitos or Cuba libre. One of the first rums I added to my collection. The taste is just okay, nothing special about it. It's a good rum to start your collection with. It's flavours aren't to strong so you can use it to learn to drink rum straight.. Also comes in handy to give your cocktails an extra punch and a bit stronger rum-taste than a regular white rum. Denne rom egner sig bedst til at mixe. Men det gør den til gengæld rigtig godt. Makes a very nice cuba libre! This is pretty good (and inexpensive!) rum. You can't buy it in the US but it's legal to bring back. Since Canada is exactly 102.5 miles up I-81 from my driveway in Syracuse I go from time to time and I always bring some back. It's $17.66 US for 750ml. I use it and the 3 year as mixers with tonic because I like to keep things simple. Just tonic, ice, Havana Club and lime juice sets me up fine. Bacardi has tried (and so far failed) to sell their orina de caballo under the Havana Club brand. Make sure you have the real ron de Cuba or else you'll wind up drinking Castillo at a premium price. My first taste of Cuban rum. My first sip was nothing special. As I continued to partake in it the flavors started to show themselves. The oak was ever present but you could tastes tobacco and honey in the background. I hope to purchase 2 bottles to take back home.